You are in Home > Blog > Food & Drinks > What's in Season in May? What's in Season in May? What's in season in May? With summer just around the corner you'll have a rainbow of colors to choose from when it comes to fruits and veggies. The variety will certainly inspire you to get creative in the kitchen. On the savory side we have leeks, radishes, green peas, artichokes, garlic, celery and kale, to name a few. While you'll be able to satisfy your sweet tooth with strawberries, pineapple, mango, cherries and more. You'll see cherries pop up everywhere this month. This sweet and juicy fruit is perfect on its own and incredibly decadent when turned into preserves, desserts or added to savory dishes such as the smoked eel risotto pictured above. Click here for our favorite cherry recipes. We love the versatility of strawberries. For a surprising pairing, serve strawberries with a touch of aged balsamic vinegar, as is commonly done in Italy. Click here for delicious strawberry recipes. Depending on where you live you may start seeing mangos in the produce aisle of your local grocery store. This tropical fruit is aromatic, juicy and just the thing to jazz up your smoothies, salads, desserts and curries. Find mango recipe ideas here. Also in season in May are fresh apricots, which possess a surprising sharpness that isn't palpable in the dried version of the fruit. Either way, they are delicious and a fun topping for cupcakes. Click here for creative apricot recipes. There is no better time to cook with leeks than in late spring when they are abundant and affordable. Leeks add a sublime touch to any dish you would normally prepare with onions: soups, salads, frittatas, and anything sautéed or roasted. We are especially fond of this silky green pea and leek soup. Find more leek recipes here. The natural sweetness of carrots add depth of flavor to any preparation. 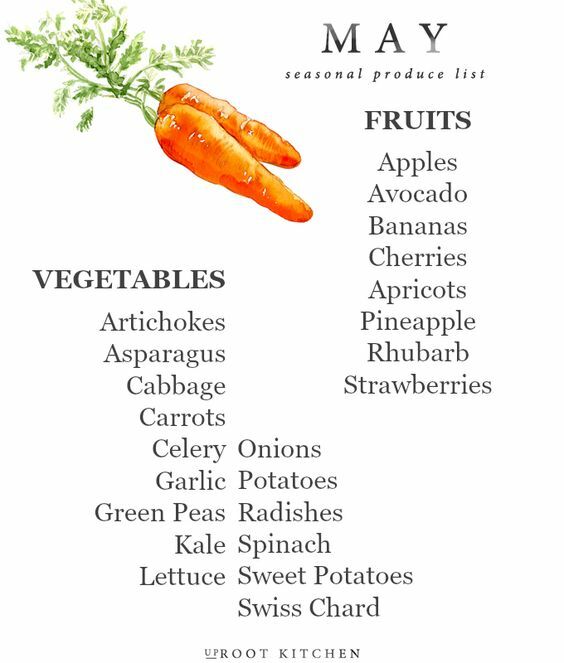 But don't overlook their crunch - raw carrots are great for dipping and fantastic in smoothies and salads. Click here for carrot recipes. Fresh green peas are a spring staple. Enjoy them in tasty quiches, soups, salads and much more. Check out our favorite pea recipes. Artichoke season is upon us. Learn everything there is to know about prepping, cooking and eating artichokes. Plus, tips on how to steam artichokes. Click here for stellar artichoke recipes. What else is in season in May?